Gehlot emerges front-runner for CM post Veteran Congress leaders Kamal Nath, Ashok Gehlot and Bhupesh Baghel appear to have emerged as the frontrunners in the race for chief ministership in Madhya Pradesh, Rajasthan and Chhattisgarh respectively as the party put in motion the process of government formation in the three states where it dislodged the ruling BJP from power in the just-concluded Assembly elections. Read full article..
Sachin Pilot, Congress on next Rajasthan CM: Whatever the MLAs have to say they will say in the meeting and final decision is left to the Congress president and other party leaders. We will take a call today. Mayawati, BSP: Results show that people in states like Chhattisgarh, Rajasthan and Madhya Pradesh were totally against the BJP and its anti ppl policies and as a result chose Congress due to lack of other major alternatives. Mayawati: Even though we don't agree with many of Congress's policies we have agreed to support them in Madhya Pradesh and if need be in Rajasthan. BSP supremo Mayawati said her party will support Congress in Rajasthan, if required. Jayant Chaudhary, RLD: I am happy that the public has given a clear mandate in Rajasthan, for a stable Govt, our MLA will extend support to the Congress. BJP ran a negative campaign, UP CM came and talked of Ali and Bajrangbali instead of issues of farmers. 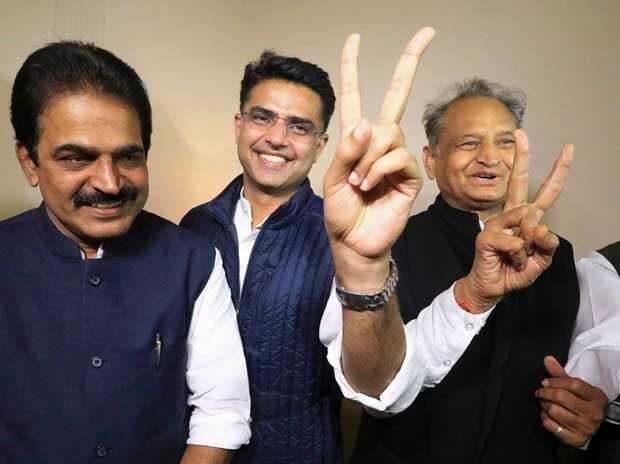 Rajasthan results: Talks are on between former chief minister Ashok Gehlot and a few Congress rebels who won as independents in the polls, according to PTI reports.